> Dividing a hive to make a new hive- Here’s How! Dividing a hive to make a new hive- Here’s How! Wondering if i could pick your brains for some advice please ? I brought a nucleus from you last year, which is now a thriving healthy colony that i am looking to split this spring. I keep the hive on my roof in Earlsfield. So far it’s worked really well but I’m keen to try and avoid them swarming and the problems this might cause in an urban area. The neighbours are nicely on side but a swarm of bees in their back garden might test neighbourly relations. I’d also like a second colony to take to the moors in August to take advantage of the heather. So I was thinking i could get the best of both worlds by splitting the hive early in the season, avoiding a swarm by giving the existing colony more room and gaining an extra one that would have time to build upto full strength by August. Does the above plan make sense? Do you have a proven method to go about it ? Many thanks for your help / advice. Really glad to hear the nuc you bought from us is doing so well. Reports back from other buyers are the same, fast build up and good health coming out of the winter. Well done for looking after them so well. This is a common practise among beekeepers for all the reasons you have just described. Its a very straight forward method. Here’s how. A- 2 x frames fully sealed brood. B- 2 x frames of open brood, eggs and sealed brood. Make sure there are EGGS as this hive will be queenless and need to make a new queen. No eggs, no new queen! Now that you have the queen safely in a cage in your pocket. Take each frame from the original hive and shake the bees off the frame into your new hive box. Do this to all the frames, shaking the bees into the new brood box. Fill up the remaining brood box with frames of drawn comb or foundation. Put a feeder on and keep feeding until all the frames are drawn out and 1/4 filled with stores. Go back to your original hive and slide the remaining frames central in the brood box. Put frames of drawn comb or foundation each side filling the gap. Now gently release the queen back into her original hive. Do not shake her out of the cage as you might fling her outside the hive instead of inside. Put the coverboard back in place and feed this hive as well. 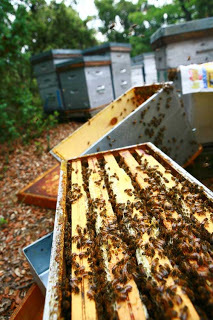 NEVER FEED OR MEDICATE A HIVE WTH HONEY SUPERS IN PLACE. Always do this well before or well after the honey flow. Now most all the old flying bees will fly back to the original hive, rejoin the queen and carry on. The new hive you have made will be full of young bees capable of creating queen cells from the eggs. Then all you need to do in 14 days is remove all but 2 sealed queen cells. Never just leave 1 cell as it might just be the only one that is unviable. The first queen out will win! So now you have controlled swarming on one degree, made two colonies and they are in a fit state to begin the season. Once the new colony has a laying queen with sealed brood from her, you can move them to the new location if you wish. There are many many ways to divide, create colonies, rear queens etc. It comes with time and practise. This is why beekeeping is so fun, exciting, challenging and grabs the imagination of the beekeeper. It’s every changing which keeps you on your toes. Really never a dull moment! Hope that helps and good luck with your beekeeping this year. Keep up the good work! Thats great , many thanks for the quick response. I had to read it a couple of times, but i’m with the picture now, and looking forward to attempting the split ! I’ll let you know how i get on. I’m thrilled to bits with the Bees and really enjoying looking after them. Have been amazed at how good natured they are. I was expecting world war 3 everytime i went in the hive. I couldn’t have been more wrong.